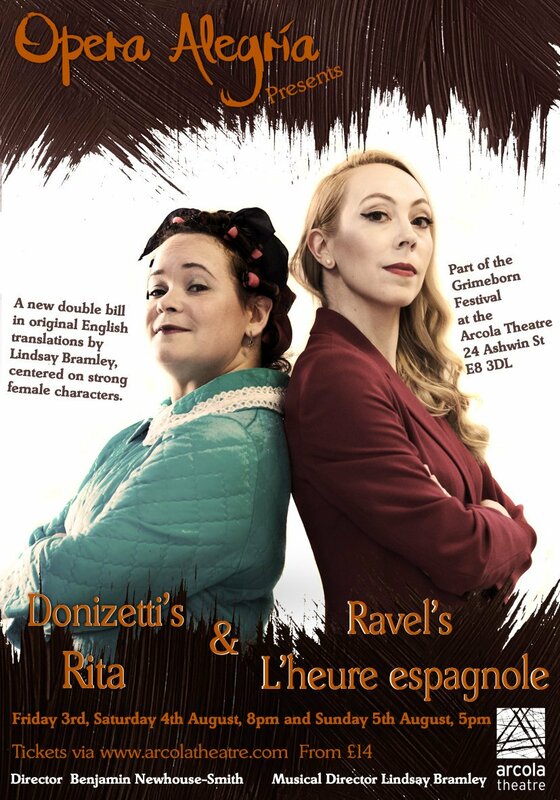 Opera Alegria made a return to the Grimeborn Opera Festival at the Arcola Theatre this Friday, August 3 with a double bill of ‘domestic comedies’ Donizetti’s Rita or The Beaten Husband and Ravel’s L’Heure Espagnole, both performed in English. In Donizetti's Rita soprano Naomi Kilby sang Rita. Richard Belshaw played Beppe, her current husband, whilst her former husband, in this translation, Graham Ramsbottom was sung by Christopher Faulkner. In Ravel's L’Heure Espagnole Alicia Gurney was Concepción, Ian Massa Harris her husband, Stuart McDermott was Gonsalve, Matthew Duncan was Don Inigo Gomez and Thorvald Blough was Ramiro. Benjamin Newhouse-Smith was the artistic director and musical director Lindsay Bramley provided the piano accompaniment. The action of Rita is transferred from northern Italy to a bar on the Costa del Sol where Rita rules her roost and husband Beppe with an iron rod. Their worlds are turned upside down with the arrival of Rita’s first husband who was presumed dead. They eventually get the love that they’re due, via a broad selection of sea-side postcard comedy, some improbable scheming and a smidge of familial abuse. Benjamin Newhouse-Smith, the director, decided to qualify the original casual xenophobia and the joys of domestic violence to make the journey more acceptable to our modern sensibilities. Donizetti’s jaunty music charmed with its irresistible rhythms and melodic freshness. The cast led by Naomi Kilby had an infectious enthusiasm, relishing their parts. As Rita, the Hilda Ogden with a fearsome hold over her husband Naomi Kilby had enormous fun. She had the necessary forcefulness and vocal energy but that occasionally failed to carry through into her dialogue making her seem a little too vulnerable. Christopher Faulkner gave a charismatic turn as the Flash Harry like Graham Ramsbottom but depriving him of his paean to wife beating with all its concomitant nastiness he became a less objectionable character. I wasn’t sure where my sympathies should lie. Pity then that Richard Belshaw’s Beppe couldn’t quite do enough to elicit my empathy and transform himself from patsy to a gentle man who loves Rita. After the interval, we were transported to the emporium of Torquemada the clockmaker in Ravel’s L’Heure Espagnole. Concepción (Alicia Gurney) is busily trying to arrange assignations under her husband, Ian Massa Harris’, nose. Both Stuart McDermott’s disobliging Gonsalve and Matthew Duncan’s Don Inigo Gomez, whose pendulum stops, leave the naïve but efficient muleteer Ramiro (Thorvald Blough) to have his turn. Alicia Gurney’s scarlet seductress would clearly be a handful for anyone. She makes hay as the frustrated Concepción, seemingly unaware of the charms of the hunk Ramiro. How myopic can a person be? There was only one way this was going to play out. Their appealing chemistry rendered the machinations of the nascent humpees irrelevant. Maybe Thorvald should dirty himself up a little more? I didn’t care for Gonzalve’s serenades or the indignant Don Inigo and the comedy felt laboured. Maybe Ravel was striving for something more than the comic text would allow. There were moments when the humour was completely subverted by the music. In the end, I may have wished for an evening with a little more bel canto elegance, but these pieces aren’t meant to be some recherche exploration of personal relationships, they’re Buffa, and you just can’t resist.